The Lilac-tailed Parrotlet nests in an arboreal termitarium (termite mound in a tree). Both adults green/yellow head; brighter yellow with black scalloping on face and nape to sides of neck; black upperparts; rose/red carpal edge; pale blue foreneck tinted green; pale blue/green breast mixing into yellow/green on abdomen to undertail coverts; blue underwing coverts marked with yellow and red near to carpal edge and bordered with black along leading edge; purple central tail feathers; lateral tail feathers purple/lilac and barred with black near tip. Bill olive/yellow with grey at base. Eye ring grey. Eye yellow. Calls made in flight are soft and nasal, rising to a high-pitched, whining sound. Before taking flight emits weak, nasal calls, and short trilling or chattering notes. Keep indoors in minimum temperature 20C (68 F), minimum length 2.1m (7 ft). 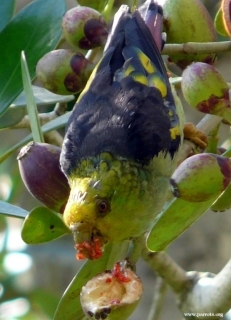 Lory formula; flowers and buds; tropical fruits such as: mango, guava, papaya; other fruits such as: apple, pear, oranges, pomegranate, cactus fruits; vegetables such as: carrot, celery, green beans and peas in the pod; green leaves such as: Swiss chard, lettuce, sowthistle, dandelion, chickweed; fresh rose hips, elder and mountain ash berries; sprouted seed mix of safflower, millet, oats, hemp and some sunflower; mineral supplements; fresh non-toxic branches. Provide unsprayed, bird-safe variety of branches. This species may have declined locally owing to deforestation. Trinidad, Guianas, and possibly Amapa, N Brazil; also scattered across N Venezuela, reaching N Colombia. Found up to 1700m (5576 ft) in primary forest or taller secondary growth in tropical and subtropical zones; also may be seen lower down at forest edge and at clearings in dry deciduous and humid forest. Feeds on flowers, nectar, buds, berries, seeds and fruits. Seen generally in flocks of 10-30 individuals or more outside breeding season. Highly social when feeding and at roost. Keeps to upper stages of canopy, but comes lower in fruiting trees. Continuous chattering while flight. 5-6 almost spherical eggs, 22.0 x 19.5mm (0.9 x 0.7 in).